Can I claim to councils after cycling on poorly maintained cycle paths? Councils are often paying out to motor vehicle drivers for damage to vehicles, sometimes with courts being involved. There are several websites giving advice on how to claim for damage, including the government and councils‘ own websites. As someone who passed my driving test a decade ago and was priced out the market by the insurance companies, I haven’t driven a car since. Thus I generally use the bicycle as my main mode of transport, when I’m not walking or taking public transport. The bicycle is also a great way to get away from the computer screen and get some exercise. Trying to follow a map or GPS can be hard, and can involve some stopping and starting. I much prefer to follow signed routes, or follow signs to places. This is relatively easy to do in The Netherlands, however in Britain the place name signage is usually aimed at motor vehicle drivers only. This means following place name signs can be difficult. On another part of the path that wasn’t quite so muddy, I came across a family trying to encourage a 2-4 year old to cycle their bike however the surface was difficult for me to cycle, so no wonder the child was throwing a tantrum. If a young child can’t cycle on a cycle route all year round than it simply isn’t good enough. When I go out for a bike ride I don’t expect it to end up caked in mud and to have to spend several hours cleaning and maintaining it, which I wouldn’t have to do if it was a good quality surface. Can I put in a claim to the relevant councils for failure to maintain the path thus having to spend time cleaning my bicycle and the extra maintenance required? 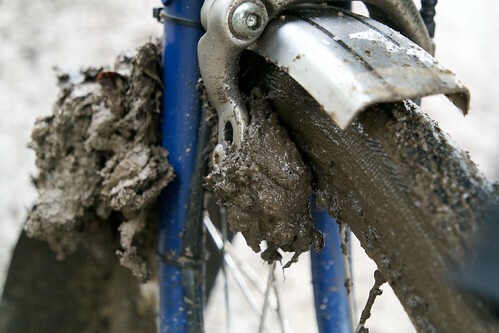 Had the councils put in a proper maintenance plan when they created the cycle routes originally they wouldn’t be in their current muddy state, hence the reason for thinking about claiming. It’s all very well councils spending money on new cycle routes and facilities, however if they don’t ensure the current routes are kept in good condition, they aren’t going to encourage more people to cycle, rather put of the ones who currently do. After some discussion with Sustrans, I have discovered that there is a plan to upgrade the above path to a higher standard, however it’s taken a lot of campaigning to get to the stage of producing a plan with the council. Would putting in these claims make councils put more money towards cycle path maintenance? 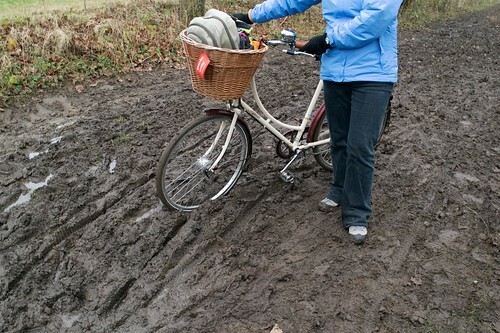 How long is it going to take to upgrade all of the other cycle paths across Britain that are bumpy or muddy? When will central government have a significant pot of money for upgrading current cycle in a similar fashion recently announced for the potholes? This entry was posted in Cycling on February 22, 2015 by smsm1986. 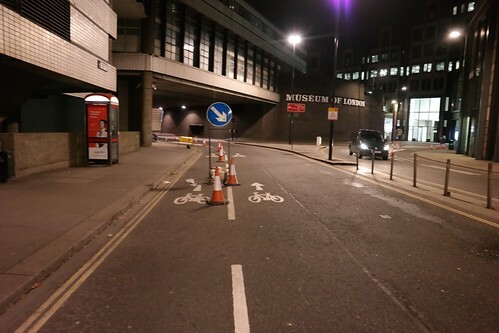 A week ago I was cycling along London Wall and past the Museum of London roundabout, and noticed some changes with paint and traffic cones. As you arrive at the roundabout you choose which side of the cones to go on depending on whether you are turning left or taking the straight on or right exit. 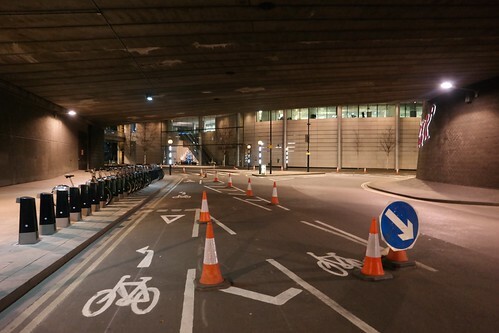 Left turn cyclists are given protection by the paint and traffic cones, whilst the straight on or right turn cyclists are mixing with motor vehicles. Then on the roundabout left turn cyclists are expected to give way to other cyclists coming round the roundabout as they about to exit the roundabout. Are these give way lines really needed? Can’t cyclists nicely merge together without needing to have priorities like motor vehicles require? There is enough space to have 2 cyclists side by side without impacting motor vehicle traffic, thus this shouldn’t be an issue. Most importantly I’d like to question why cyclists who are not turning left are expected to mix with motor traffic? This is not going to help encourage inexperienced cyclists to use the roundabout. Will the cones stay there long term? 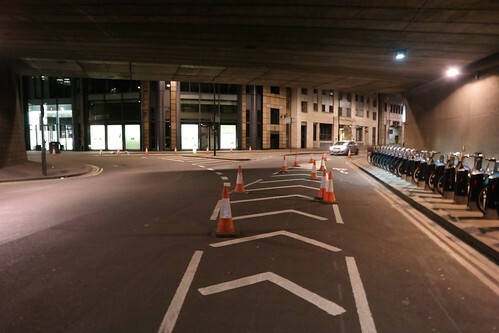 Or will the cones be removed with motor vehicle drivers simply ignoring the white paint? Could drivers complain at cyclists going straight on or turning right for not using the cycling facility (i.e. being to the left of the cones/paint)? 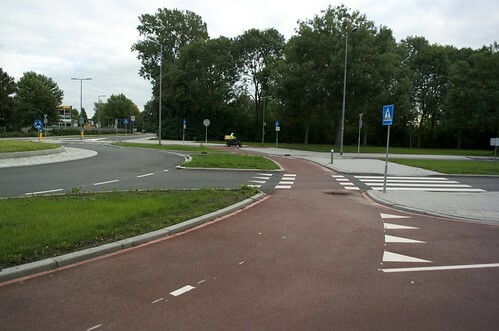 Why not follow the tried and tested Dutch designs for roundabouts since there’s plenty of space? Both David Hembrow and Mark from Bicycle Dutch have blog posts explaining Dutch roundabouts, thus I won’t go into detail here. 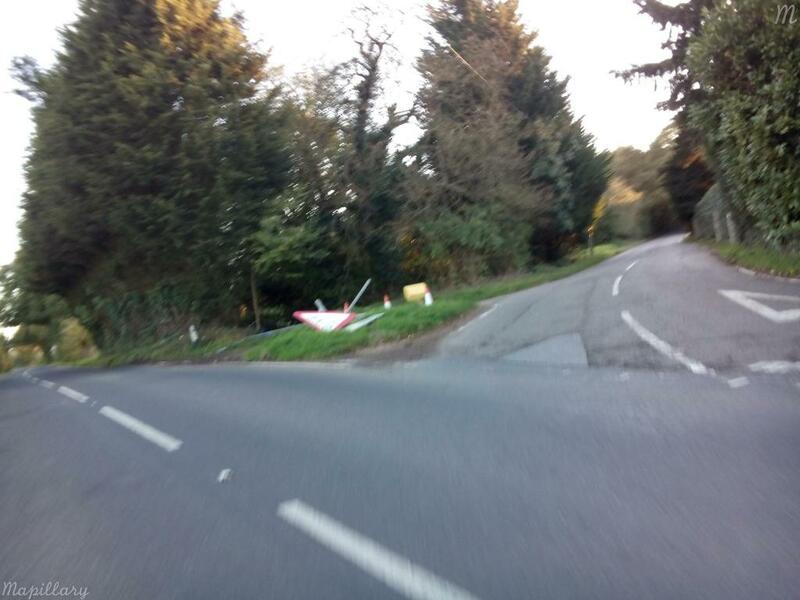 This entry was posted in Cycling, London on December 28, 2014 by smsm1986. Over the past few years I’ve noticed a huge rise in the number of parents, particularly of younger pre-teenage children getting involved with cycle campaigning. This was particularly evident in the discussions at the November 2014 Cycle Ipswich meeting, where several parents commented about the problems that they have with cycling locally with children. One of the local parents has had abuse shouted at her for cycling with children in Ipswich, with several noting that some people see cycling with children as child abuse. Yet in other parts of Ipswich there are some of the highest levels of cycling to school in the country due to the quality of the cycle infrastructure. There are some schools where letting or encouraging your kids to cycle is seen as a bad thing, however it is simply the lack of a suitable cycling environment, or the head teacher and/or governors not understanding the cyclists often choose alternative quieter routes, that cannot be used by car. An interesting comment by the local MP Ben Gummer at the meeting was that he felt safer cycling in London, than in Ipswich. My wife on the other hand has the opposite opinion. So if the local politician avoids cycling locally, when they will happily cycling in central London, what hope have we with other people? Parents are increasingly concerned about the school run, the obesity crisis, and safety on the roads when their kids cycle. There is an increasing recognition that streets could be much safer to allow kids to be able to cycle, whereas currently there are so many barriers to getting good quality, segregated cycling facilities that allow everyone to happily cycle without a fear of being killed or seriously injured at some point on the journey. Fake “20s plenty” school safety zones don’t make the roads safe for kids. Of course one cheap solution, such as what is happening in Haddington, and Edinburgh, where the use of cars is banned on streets surrounding schools during school arrival and home times, would be much more likely to make it safer for kids. I believe that the increasing number of people who are considering cycling with children as a mode of transport is helping to fuel the dramatic shift in cycle campaigning that has happened. There is still a long way to go until there is consistency by campaigners, council officials, and politicians in the recognition that the current infrastructure isn’t good enough, and there needs to be a dramatic improvement in the quality of the infrastructure to be able to get more people cycling. This entry was posted in Cycling on November 16, 2014 by smsm1986. On Sunday I was cycling from near Needham Market back towards Ipswich along National Cycle Route 51, when an incident occurred that reminded me of the Nice Way Code’s “Think Horse” video. It got me wondering what if car drivers had to treat me the same way I had to treat that horse? As a bit of background to the video and campaign I’ll leave it for Bez/Beyond the Kerb’s excellent and detailed blog post, which is somehow not playing for me on YouTube any more. 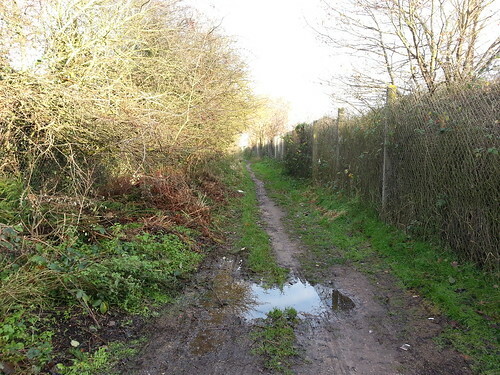 The section of the cycle route I was cycling along is a bridleway with a couple of tire tracks. As I approached the horse, rider, and person walking the dog beside them, I slowed to the same pace as them in the hope that they would wave me past. Shortly after the point in the picture above, the path curves around and then drops down the hill. 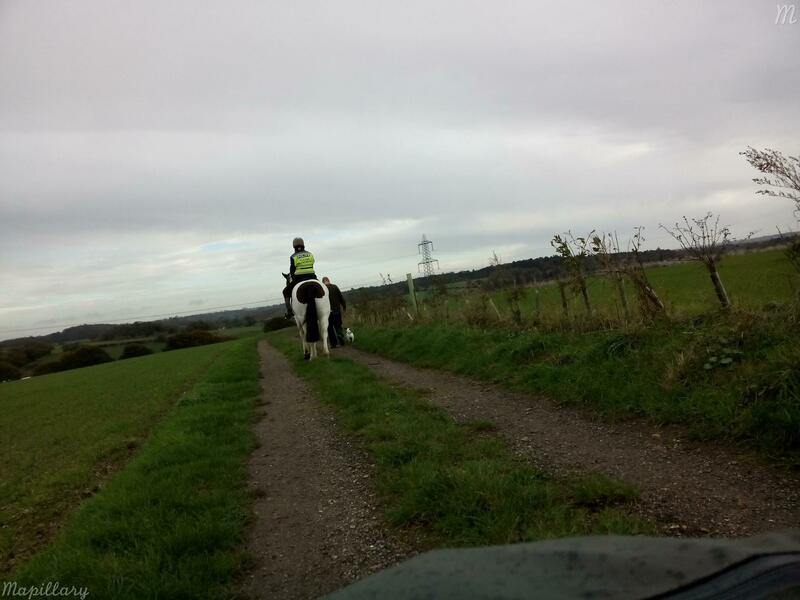 The horse seemed a bit timid hence why I did just try to pass. The horse rider then turned round and asked me to wait until she’d got to the bottom, which I happily did. Now going back to the Nice Way Code and the “Think horse” video. Does that mean if I’m at the bottom of a hill and feeling a bit scared by the drivers passing me, I can turn around and say that they need to wait at the bottom of the hill until I get to the top? I wonder how the driver would react? Would being able to do this encourage more people to be able to cycle? Or would drivers just think you are completely bonkers? Maybe it could be seen as a light punishment to all drivers for the few bad ones out there? Surely there can’t be anything wrong with tarring all motorists with the same brush? This entry was posted in Cycling on November 12, 2014 by smsm1986. Yesterday afternoon I was out on a cycle ride with my wife from Ipswich to Colchester via Hadleigh and Sudbury. Most of the route was covered by either Sustrans or South Suffolk Cycle routes. Some of these routes run along busy B roads, with traffic speeds of up to 60 mph through the use of the national speed limit sign. There were also various bits of squashed animal on the roads, some are meant to be quiet back lanes (instead seem to be rat runs), including the NCN1. I’ve not included any photos as it is rather gruesome. This didn’t exactly fill me with any confidence that cycling along this road, the National Cycle Network Route 13 would actually be safe. There were many cars that were driven at high speed and/or close past me, and on several occasions I feared that some driver would try and overtake when there wasn’t enough time, especially when there were many curves in the road thus short sight lines. Having cycled along the road before, I knew there was a turn off the B road and it just couldn’t come soon enough as by the time I had got there I was a little shaky. I really couldn’t see how anyone could allow children to cycle along that road, even so it’s part of the National Cycle Network. This got me thinking about how to prevent these so called cycle routes being introduced in the first place. Could councils be fined for having a signed cycle route or other direction encouraging cycling where cycle users would have to compete with motor traffic of more than 30 mph? How much would the fine be? Would £1 per metre be enough? How much would that be over a whole county? What happens if the council or police don’t then enforce the 30 mph speed limit? Would councils just ban cycling from many roads instead of reducing the speed limit to avoid the fines? Of course the alternative is to build a Dutch style cycle track that runs parallel to the main road, thus car drivers can drive as fast as they like without having to deal with cycle users slowing them down, whilst cycle users can pootle along in a safe environment without a fear of being knocked down. It would also make the road feel safe enough that many more people would feel safe enough that they would switch from the car to a bike. I wonder how much it would cost for the councils to compulsory buy strips of land down farmers’ fields to be able to create safe cycle tracks? This entry was posted in Cycling on October 26, 2014 by smsm1986. Back in June 2014 Suffolk County Council released their Suffolk Cycling Strategy. It has some good and expected bits that I can’t complain about, such as why people should cycle, however it’s rather lacking in detail and vision on how to get more people cycling. The how is relegated to a 1 page table of actions and outcomes and another 1 page appendix of planned projects. In general it’s good, however it doesn’t set any target of how much increase that is measurable. All the reasons of why people should cycle, with all the benefits, is all good and what I would expect, as are the various statistics that are listed. The delivery of the strategy has essentially been left for the single page appendix. The list of potential funding sources on page 11 is impressive, however there is no commitment from Suffolk County Council to have a specific proportion of the transport budget allocated to cycling infrastructure. This contrasts with Edinburgh City Council who have allocated 5% of the transport budget to cycling infrastructure, increasing that by 1% a year. The first item in the list of references is a link to the Get Britain Cycling report, however only mentions it as the “All Party Parliamentary Cycling Group”. The strategy also ignores one of the key recommendations of a cycling budget of the report which is the amount of sustained funding required for cycling. If this was implemented then there would be between £7.2 million and £14.5 million spent on cycling each year in Suffolk. Or between £1.3 million and £2.6 million in Ipswich alone. Full figures for all local authorities based on the last census are available in my previous blog post. Which works out to be about £20 per person, which is also the upper figure recommended by the Get Britain Cycling Report! Thus solely on the grounds of public health, the council should be increasing their spending on quality infrastructure, thus reducing the health care costs. This would avoid the current problem of any significant changes to the cycle infrastructure require either new developments to contribute section 106 funds, or there to be a bid to various funds, which I discussed recently in the hidden costs of British cycle funding. The main part of the strategy document doesn’t discuss the current barriers to cycling such as subjective safety. Appendix A does have a whole section on the barriers. As it’s a health document it primarily covers stats about risks of injury and where injuries are likely to occur. However the perceived barriers by people who don’t currently cycle, or don’t cycle for more journeys are not covered anywhere. Rather than just countering these perceived barriers and lack of subjective safety with education; looking at improving the infrastructure would go a long way to changing things, as improving the infrastructure, is more practical, and cheaper than stopping everyone (both motor vehicle drivers and cyclists) as they enter Suffolk and ensuring they have been given some training on how to “share the space” or “taking the lane”. Lets look at some of the actions and outcomes proposed. There is a full A4 page with a table covering the strategy, actions, and outcomes. What’s there is good, however there could be more detail, I’d expect the bulk of the strategy discussing how the strategies would be implemented and potential barriers to implementing the strategy and how these barriers would be overcome. The row of the table on fostering enthusiasm for cycling in young people is good for encouraging schemes such as Bikeability, Sustrans Bike It, and the Primary school bike project; and also facilitating school travel plans. However this seems to require the schools to make the first move, and to want to run the schemes. What happens when a school head refuses to allow kids to cycle to school as it’s too dangerous? I’d like to see an action where the council work with schools to ensure that routes to schools are safe from an infrastructure perspective. How about an ambition of every single school pupil in Suffolk having Bikeability training to level 3, with further training as required? The strategy mentions to “adopt best practice as described in the Manual for Streets 2”. What happens if better advice such as Making Space for Cycling, or the upcoming TfL London Cycling Design Standards, or even the Dutch Design manual for bicycle traffic (CROW)? Should these be included explicitly, or a simpler action of looking for and acting on upcoming standards and advice? One of the actions is to “Focus on improving areas with infrastructure to maximise return”. I’m assuming this means cycle infrastructure. This is all very well, however there would then be an increasing disparity in which parts of the county have infrastructure. 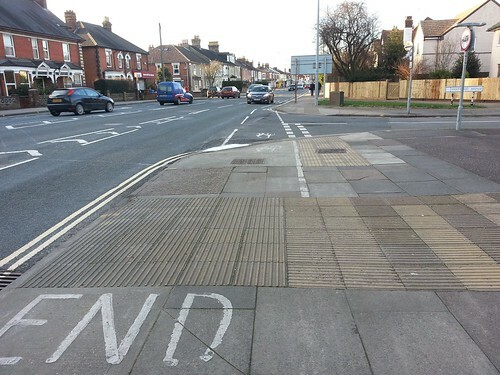 As an example the infrastructure in Ipswich varies quite widely, and this suggests that the council will improve current facilities over doing something radical or larger in an area which desperately requires improved cycling facilities, for example where there are none in the lead up to a school. This is already a significant problem in the South West of Ipswich with several schools close together, and sixth form college where many pupils drive there, and there’s no parking for pupils on site. I’d like to see some additions to the strategy “Create a safe and cycle friendly environment” such as considering modal filtering, and looking at whole areas to see how rat runs can be removed. Also using temporary infrastructure to create modal filters or segregated cycle tracks is a great way to trial a scheme before going permanent with it. 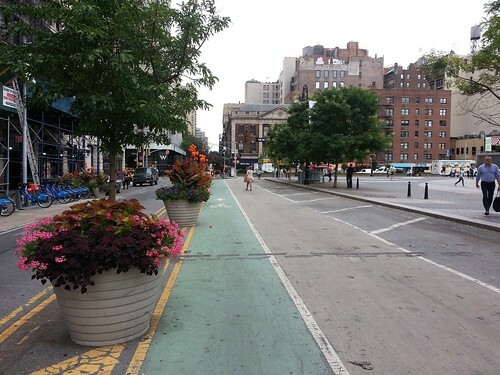 This has happened in New York, and is currently happening in London with the mini Holland schemes. This has been hard to write, as a lot of the content in the strategy can’t be argued with. I really want to see a huge improvement to the cycle infrastructure so that everyone feels safer cycling and thus increasing the number of people cycling and gaining the various benefits mentioned in the strategy. On Thursday 9th October Cycle Ipswich are taking the lead from Leeds Cycling Campaign’s Cycling: A Vision for Leeds, by holding a public meeting to gather ideas for a cycling vision for Ipswich, with the aim of using Cyclescape to have a long list of items to improve. Full details are available on the Cycle Ipswich website. 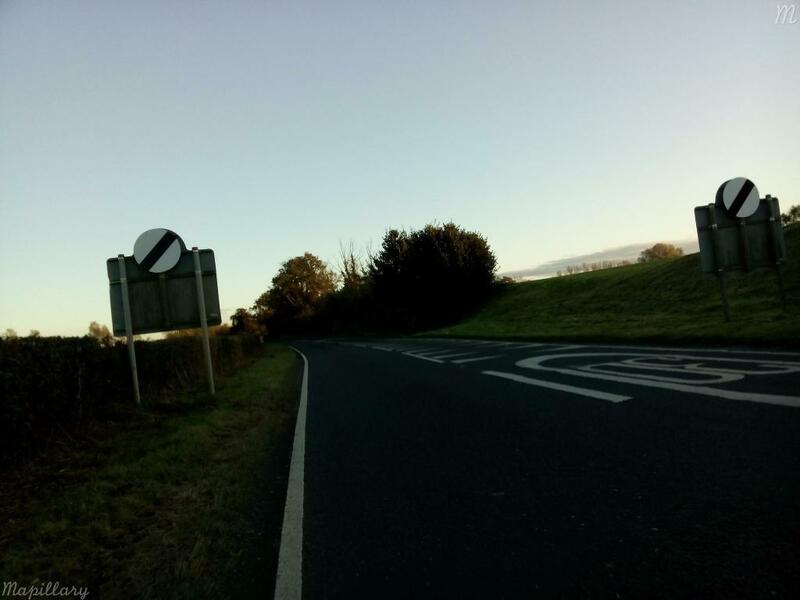 This entry was posted in Cycling, Ipswich on October 6, 2014 by smsm1986. Mapillary is a new project to allow people to collect street view like images easily with their smartphone or other camera. It means that if you want to have street view images of some cycle path or footpath you can easily add it, unlike with Google’s street view. 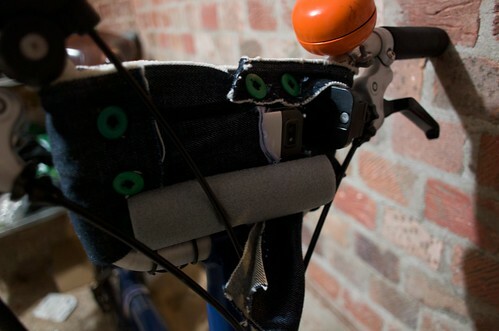 To make it easier to collect the images on my Brompton I have made a little holder for my phone using some custom cut denim sewn together, adding some buttons and button holes. Adding the trim around the hole for the camera, and a section of fabric to keep the camera out front, were required otherwise the denim was fraying and causing single strands, or a big chunk of fabric, to get into the image. I’ve added a piece of pipe insulation to help cushion and steady the movement of the phone, otherwise the phone moves too much and generates too many blurry images. It now seems to be at the stage where it’s pretty reliable. 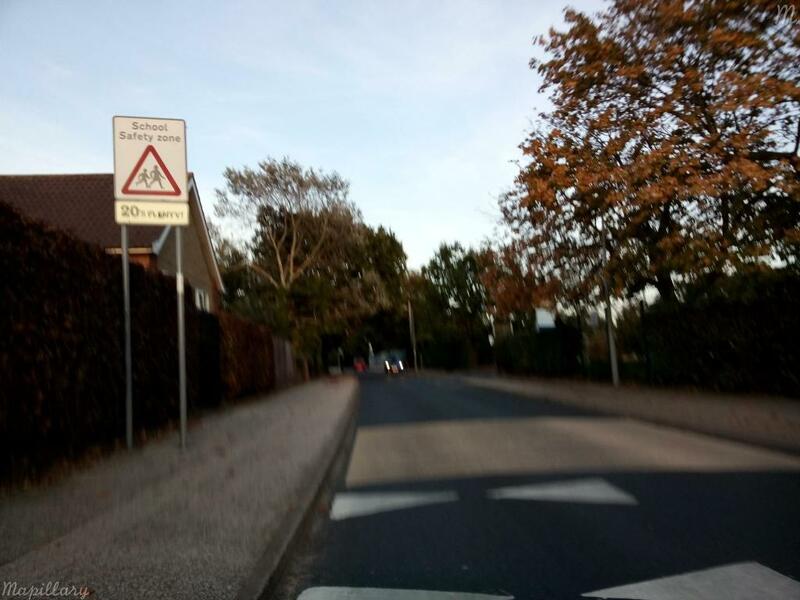 This entry was posted in Cycling, Mapillary, OpenStreetMap on September 22, 2014 by smsm1986. Having been to many places now, I’ve started noticing a pattern of a particular itch or tingly feeling I get in my legs to hop on the bike and cycle somewhere, potentially aimlessly. Cycling aimlessly involves hopping on the bike and just randomly cycling wherever looks good. This desire usually comes from the quality of the cycle infrastructure, news about changes, or better said improvements to infrastructure, driver attitudes, and levels of motor traffic. This test will have different results for each person based on what they’ve heard, and their personal preferences with regard to safety, and speed of cycling etc. I’ll start with the most obvious one. When taking a train through The Netherlands, I look out the window and see the high quality cycle infrastructure, and would prefer to be on my bike than on the train, even if it would take longer. On another trip I had a day in a town with not much to do, and I couldn’t find anything better than just randomly cycling around the streets and cycle paths. (I was on a budget, thus it was a good way to keep me occupied without spending money). While doing so I felt perfectly safe with no fear of being run over by some motor vehicle. On a recent trip to New York, I wanted to see what all these bike lanes and tracks were all about, and to see what it like to cycle in the city. The desire to cycle wasn’t aways there, and I even had a couple of occasions where I was pushing the bike, such as around Times Square while cycling along Broadway from Central Park to about 11th Street. However I slowly got to know which streets and avenues where nicer to cycle on thus could switch to those instead. In general the avenues were better due to fewer traffic signal stops, and often being quieter, however the avenues had better cycle tracks (locally called lanes). In London, I’ve come to know the nicer off road cycle paths and quieter back roads, thus have some desire to out and cycle, however aimlessly cycling randomly is a desire I generally lack due to the lack of infrastructure. In Ipswich, Suffolk, I don’t get this desire to get out and cycle much. The majority of the roads have to be shared with motor vehicles. Where cycle lanes do exist, they are usually so narrow that I can’t fit in them, never mind having a buffer between myself and the overtaking motor vehicles. Where there are off road cycle tracks, there’s only the occasional one which is high quality. Normally though it turns out to be shared with pedestrians, whether completely shared or a painted line down the middle doesn’t make much difference, or the surface quality is extremely poor, such as the flagship National Cycle Network Route 1 being just mud in places. Aimlessly cycling is a desire I don’t get in Ipswich. Rather I have to somehow encourage myself to get out on the bike. Once I’m further out of Ipswich, or in an area where the traffic is quieter or there is cycle tracks (though very few exist – I’m not convinced the overuse of legalised pavement cycling counts) it does get nicer, and I start to enjoy it. Another way of phrasing aimless cycling would be leisure bike riding where you go out on a bike ride just for fun, and not. I find the desire to randomly cycle is primarily based on the cycle infrastructure and the style of driving in each area. I suppose the test is a variation of The Copenhagenize Index comparing bicycle friendly cities, without the formal categories. Would you agree with this desirability to cycle aimlessly test? This entry was posted in Cycling on August 24, 2014 by smsm1986. I’m increasingly finding that many people who want to cycle in Britain, have two options for their style of cycling. Note this doesn’t apply everywhere, however is particularly prevalent in Ipswich, Suffolk and other places that I’ve cycled. If you are in the mood for cycling slower at a pootling pace, or have kids learning to cycle, you can use some pavements where cycling has been legalised. However when there are higher pedestrian flows, you’ll often have to travel slowly at walking pace, thus negating the advantage of cycling for those sections of the journey. This means the journey time is extended, and made more tedious and less enjoyable. The alternative used by faster cyclists is to keep up with the speed of motor traffic and to take the lane. This would mean cycling at 20, 30 or more mph. I can manage the odd sprint at 20mph on the level, or 30mph on a downhill stretch, however it’s not something I can manage for longer sprints or whole journeys. I have had occasions in the past where I’ve kept a fairly constant distance of a couple of bicycle lengths from the vehicle in front, and had the driver behind either honk their horn at me for being in the way, or dangerously overtake to squeeze in between me and the vehicle in front. Thus keeping your wits about you, taking the lane, and travelling at a similar speed to the vehicle in front doesn’t appear to be a valid option either, even so I’ve regularly been told to do this by experienced fast cyclists. 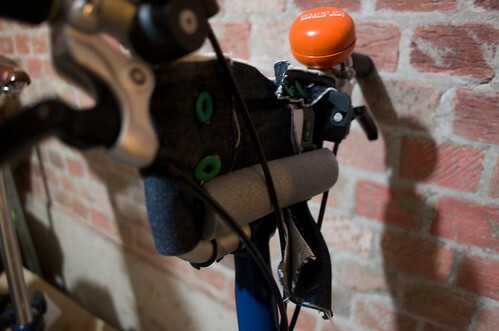 Being able to cycle at a speed between walking pace and motor vehicle pace is the ideal solution, however the current road environment in Ipswich and many other parts of Britain doesn’t make it easy to travel at a comfortable pace. 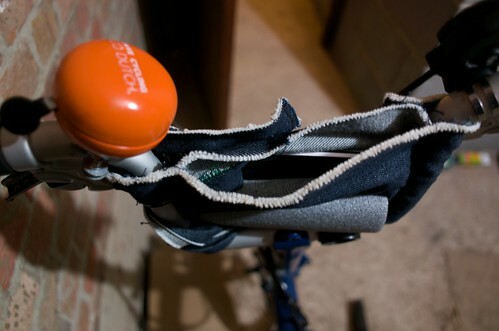 For example being able to cycle somewhere without breaking into a big sweat, at a speed faster than walking pace. Ipswich has a lot of pavements where cycling has been legalised, however you are generally having to negotiate pedestrians. I’m told that if you don’t like that, then you should be on the road, however I find that to be a horrible experience too, and it’s also dangerous due to the big metal boxes on wheels, that could kill me. Quiet residential and service roads do allow for the middle pace of cycling, however they are often riddled with pinch points, traffic calming, rat runs, on-street car parking, or busy periods(or just lots of traffic). Thus these roads are often not perceived to be safe for cycling on by many would be cyclists, or parents wanting to let their kids to cycle. Ipswich does have a few great bits of cycle infrastructure, such as a section of Rope Walk, which has been closed to through motor traffic, and pedestrians respect it due to the wide pavements, and the road like feel of it. There is a downside in that just to the north there is a rat run, which is on National Cycle Network Route 1, as drivers in the morning peak try to avoid a set of traffic lights. In the other direction, there’s a junction which has made it to the Warrington Cycling Facility of the Month. 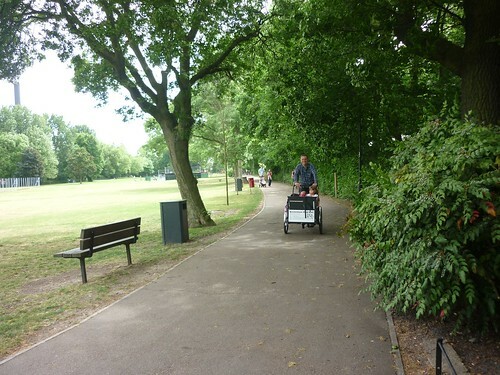 Ravenswood and Kesgrave/Grange Farm are more recent housing estates in the Ipswich area, which have high quality cycle paths through the areas, limited through motor vehicle access, and some of the highest cycle to school rates in the country. However many of those people don’t venture out of the area by bike. The bike paths are just a 3 metre wide bit of tarmac with a white line down the middle, which simply isn’t wide enough for catering for both fast cyclists, and people wanting to cycle side by side talking to each other. The new Ipswich Northern Fringe or Ipswich Garden Suburb, as it’s now called, is due to have high quality cycle paths throughout. A high quality cycle route is also needed from the new development in the north to the town centre, however it’s hard to find the best possible route that will be used, as any route that is chosen will need the through motor traffic removed due to the narrow streets and park (which is closed at night) in the way. My fear is that the compromise will produce a route which won’t entice the new residents on to their bikes or buses. Finally, how do we get some of the current older cyclists, and campaigners who are happy with the current road conditions for cycling and are holding back campaigning for cycling facilities that will encourage more people to cycle, to accept that the current two tier system is inadequate? This entry was posted in Cycling on July 19, 2014 by smsm1986.